Witnesses have a different version of what happened when police shot and killed Perez-Lopez, community members say. According to police, Perez-Lopez was seen wielding a knife while allegedly trying to steal a bike from an unidentified man on Thursday night. Two plainclothes officers stopped him, and ordered him to drop the knife. When he failed to drop the weapon, both officers fired multiple rounds at him, killing Perez-Lopez instantly. But community members say that Perez-Lopez had only just enrolled in English classes, and likely did not understand the officers' command to drop the knife. Neighbors also argued that they have yet to find a witness to back up police claims that Perez-Lopez was actually trying to steal the bike. In fact, they insisted, he had been trying to retrieve his phone, which the victim had allegedly borrowed from him. Those who knew Perez-Lopez also talked about his upstanding character. Eduardo Roman, who worked with Perez-Lopez in construction jobs for two years, said that he had been supporting his family in Guatemala, including three younger brothers. "Just two days before he was killed, he was talking about his dream to send them things, like toys and money," Roman said. "Why did they kill him? He was a nice guy, a hard worker, supporting his family." After sharing eyewitness accounts and chanting slogans, the protesters filed into the school auditorium for the official Town Hall meeting hosted by police. When SFPD Chief Greg Suhr began to explain the official version of Perez-Lopez's shooting, he was interrupted by shouts of "Lies!" and "Mentiras!" 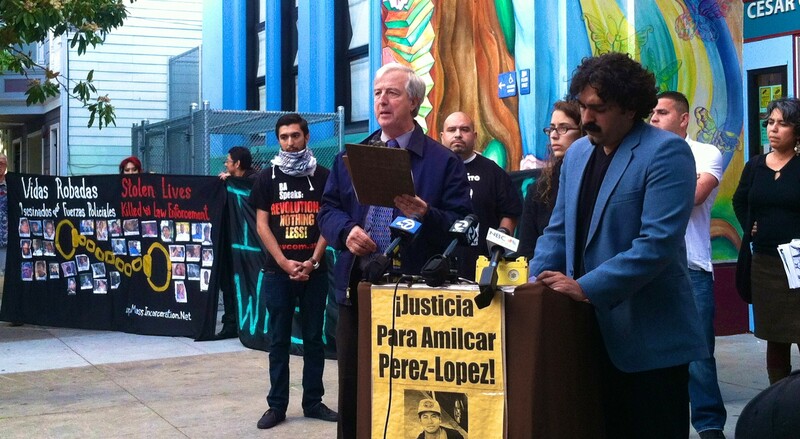 Suhr referred to Perez-Lopez as the "suspect," and community members shouted back, "He's the victim! He has a name!" Suhr assured everyone that the officers involved in the shooting will be identified this Friday. Meanwhile, the incident is currently being investigated by police and the district attorney. Despite the chief's intention to placate the protesters, residents saw it as another sign of an armed and threatening presence in their community. One neighbor, seeing the officers guarding every corner of the meeting auditorium, muttered under his breath, "Más policías que gente." More police than people.